Arthur Miller’s most famous play, Death of a Salesman, has become a key text in Western literature. This unusually powerful recording, made for radio in 1953, was directed by Elia Kazan who premiered the play. It features Thomas Mitchell and Arthur Kennedy as father and son. Willy, a travelling salesman, based in New York, relentlessly chases material success. As the disappointing nature of his reality crowds in upon him, Willy and his family suffer the tragic cost of his delusions of greatness. A domestic tragedy, a cynical indictment of materialism and the American Dream, and a profoundly moving story of one man’s struggle to maintain his dignity in the face of continual adversity – Miller’s play is essential listening. Thomas Mitchell was a veteran Holly-wood actor when he came to play Willy Loman in 1950. Today he is best remembered for two roles: as Scarlet O’Hara’s father in the epic Gone with the Wind (1939), and the forgetful Uncle Billy in the classic Christmas film It’s a Wonderful Life (1946) starring James Stewart. Mitchell was a first generation American of Irish immigrants who settled in New Jersey. In 1913 he decided to become an actor. He met another future great screen character actor, Charles Coburn, who had his own company, the Coburn Players. Mitchell gained useful experience with them, playing Shakespeare. He also began to write his own plays. It is no exaggeration to say that since his Hollywood debut in 1923, Mitchell appeared in many of the greatest films of the 20th century. In 1939 alone, he had key roles in five classic films: Stagecoach, Mr. Smith Goes to Washington, Only Angels Have Wings, The Hunchback of Notre Dame, and Gone with the Wind. As the drunken Doc Boone in Stagecoach, starring John Wayne, Mitchell won the best Supporting Actor Academy Award. Throughout the 1950s Mitchell played regularly in the theatre and on television. He created the part of Lieut. Colombo on stage (his last appearance) which was later turned into the enduringly successful TV series with Peter Falk. Thomas Mitchell died in 1962 aged 70. Arthur Kennedy, who created the role of Biff in Death of a Salesman, was also one of the leading character actors in American film from the late 1940s through to the early 1960s. Born on 17 February 1914 in Worcester, Massachusetts, Kennedy studied drama at the Carnegie Institute of Technology, and his first professional acting job was with the Globe Theatre Company, which toured the Midwest offering abbreviated versions of Shakespearian plays. This led to his first appearance on Broadway, in Richard II starring Maurice Evans, in 1937. Several more significant roles on Broadway established his reputation before moving to Los Angeles where he was spotted by James Cagney, and his movie career began. The Warner Bros. studio put him in supporting roles in several prestigious movies, including High Sierra (1941) and They Died with Their Boots On (1941) starring Errol Flynn. He played in many films as a supporting actor and was twice nominated for an Academy Award. One of his last films was Lawrence of Arabia (1962). Throughout the 1940s and 1950s Kennedy continued to play on Broadway, forging an alliance with Arthur Miller and playing Chris Keller in All My Sons (1947) and John Proctor in The Crucible (1953). In 1968 he appeared in Miller’s The Price. Arthur Kennedy died in 1989. 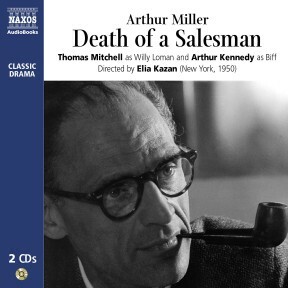 The 1953 radio production of Arthur Miller’s masterpiece, Death of a Salesman, with Thomas Mitchell and Arthur Kennedy, gets the Broadway treatment by Elia Kazan (who premiered the play). It was a sensation to audiences in 1949 and continues to move with its mix of cynical satire, realism and pathos. On 10 February 1949, Arthur Miller’s Death of a Salesman opened on Broadway. It was the play that was to establish Miller as a major American playwright, winning the Drama Critics Circle Award and the Pulitzer Prize. Its subsequent worldwide success established Miller as an international writer of significance; the play has been translated into hundreds of languages and produced in nearly every country in the world. Though ostensibly set in small-town America, it has proved to have a universality that resonates in all cultures, everywhere. Most people can relate to its main theme of family, a father’s relationship with his wife and sons, and his desperate attempt to regain the love of his eldest son. The original director, Elia Kazan, who was of Turkish origin, claimed he recognised his own father in the central character, Willy Loman, and when Thomas Mitchell played Willy, the play was hailed as the best Irish play ever. Such diverse reaction can be explained by Miller creating in Willy Loman a real human being, an everyman, with flaws and prejudices that all nationalities and people in all walks of life can recognise, and with whom they can identify. Willy is presented as a likeable rogue, an over-grown adolescent. He was, wrote Miller, ‘A man way out there in the blue, riding on a smile and a shoeshine.’ He has humour, but his idealistic values do not equip him for the tough world of business in the second half of the 20th century. They are out-dated and naïve. He places emphasis on a salesman’s personality rather than his achievements; the pursuit of success for its own sake, whether a man has the requisite skills or not, as if it was a virtue to be won. Miller is attacking the so-called American dream, the belief, encouraged by advertising and the media, that every American has the right to achieve material success, and shows the utter desolation facing a man when he realises too late the dream is an empty sham. It could be said that the part of Willy Loman is the King Lear of American drama. It has certainly attracted some of America’s greatest actors who have seen it as a test of their talents in the same way Lear or Hamlet is to actors in Britain. The part was created on Broadway by Lee J. Cobb, while the first national tour brought Thomas Mitchell to the role, later taking over from Cobb on Broadway and appearing on this recording. Frederic March gave arguably the performance of his career in the film version (1951), and later exponents have been George C. Scott, Brian Dennehy, and in a memorable TV version, Dustin Hoffmann (1985). The well-known Hollywood actor Thomas Mitchell plays Willy Loman in this recording made in New York on 24 April 1950 and released simultaneously on 78rpm records and as an LP. The text has been heavily cut and re-shaped, presumably to fit the single LP format, though the original sleeve note describes it as improving the flow a little. There also seems to be evidence of censorship, as expletives are cut or shortened, which may have been record company policy in the 1950s. Whether the adaptation was done by Arthur Miller himself, who also speaks the brief narrations, is not clear. Thomas Mitchell is supported by the original Broadway cast, including superb performances from Arthur Kennedy as Biff and Mildred Dunnock as Willy’s wife Linda. Thomas Mitchell was a veteran Holly-wood actor when he came to play Willy Loman in 1950. Today he is best remembered for two roles: as Scarlet O’Hara’s father in the epic Gone with the Wind (1939), and the forgetful Uncle Billy in the classic Christmas film It’s a Wonderful Life (1946) starring James Stewart. It is no exaggeration to say that since his Hollywood debut in 1923, Mitchell appeared in many of the greatest films of the 20th century. In 1939 alone, he had key roles in five classic films: Stagecoach, Mr. Smith Goes to Washington, Only Angels Have Wings, The Hunchback of Notre Dame, and Gone with the Wind. As the drunken Doc Boone in Stagecoach, starring John Wayne, Mitchell won the best Supporting Actor Academy Award. Throughout the 1950s Mitchell played regularly in the theatre and on television. He created the part of Lieut. Colombo on stage (his last appearance) which was later turned into the enduringly successful TV series with Peter Falk. Thomas Mitchell died in 1962 aged 70. Arthur Kennedy, who created the role of Biff in Death of a Salesman, was also one of the leading character actors in American film from the late 1940s through to the early 1960s. Born on 17 February 1914 in Worcester, Massachusetts, Kennedy studied drama at the Carnegie Institute of Technology, and his first professional acting job was with the Globe Theatre Company, which toured the Midwest offering abbreviated versions of Shakespearian plays. This led to his first appearance on Broadway, in Richard II starring Maurice Evans, in 1937. Several more significant roles on Broadway established his reputation before moving to Los Angeles where he was spotted by James Cagney, and his movie career began. The Warner Bros. studio put him in supporting roles in several prestigious movies, including High Sierra (1941) and They Died with Their Boots On (1941) starring Errol Flynn. He played in many films as a supporting actor and was twice nominated for an Academy Award. One of his last films was Lawrence of Arabia (1962). Throughout the 1940s and 1950s Kennedy continued to play on Broadway, forging an alliance with Arthur Miller and playing Chris Keller in All My Sons (1947) and John Proctor in The Crucible (1953). In 1968 he appeared in Miller’s The Price. Arthur Kennedy died in 1989. Mildred Dunnock was born in 1901 and was a teacher before becoming an actress in her thirties. She first won praise for her role as a Welsh school teacher in The Corn is Green (1940) and appeared throughout the 1940s on Broadway, culminating in the part of Linda in Death of a Salesman, a part she reprised for the film version of the play, for which she was nominated for a Best Supporting Actress Academy Award. Dunnock created the role of Big Mama in Tennessee Williams’s Cat on a Hot Tin Roof, although she lost the movie role to Judith Anderson. Her films include Baby Doll (1956), Peyton Place (1957), The Nun’s Story (1959) and Sweet Bird of Youth (1962). Appearing often in TV dramas, she reprised the role of Linda for the third time in a TV version of Death of a Salesman in 1966. She died at the age of 90.